Remember when 125mph seemed like the fastest thing in the world, while sitting on an Inter-City train in the 1980s, idly dreaming about the future? Well China has just trumped the rest of the world, launching a new 260mph train line, with Chinese government officials quick to boast about the first. China's new high-speed rail line runs the CRH380 train, which has been recorded to hit speeds of almost 262 miles-per-hour. The super-fast new trains will run on the latest rails between Shanghai's western suburb of Hongqiao and Hangzhou, covering the 126 mile trip in under 45 minutes. The CRH380 will travel at a maximum speed of a 'mere' 220 mph for commercial journeys. 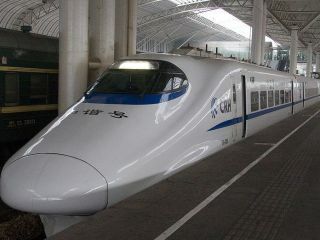 China plans to have around 10,000 miles of ultra high-speed rail in operation by 2012. Chinese officials have said that they are now aiming to hit speeds of around 312 mph with the next generation of trains. Chinese Railway Ministry spokesman Wang Yongping said that all of the technology, design and equipment of the CRH380 was created in China, although did admit that the project was initially began in partnership with Japan. "Now other countries are wanting to cooperate with us," the Chinese official said. "They all want our technology."